The view from my roof at sunset. I’ve been trying to get outside more. I love the outdoors, but the noise and congestion of New York City can make being out on the street pretty unpleasant, so lately I’ve been escaping to the roof. 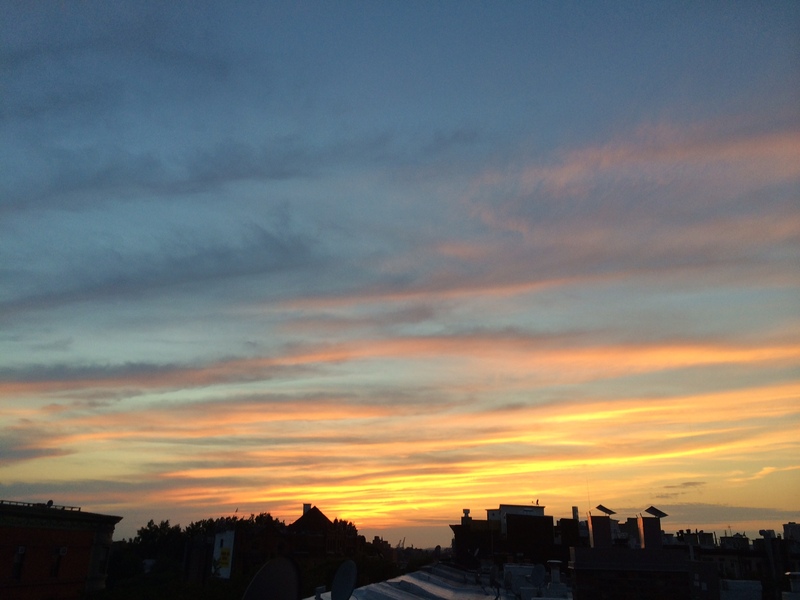 I’m lucky to have access to a rooftop, and I’ve discovered that sunset yoga up there can be pretty amazing — and free. The problem is that getting to the roof requires climbing up a ladder that’s in a really disgusting old utility closet. The closet was disgusting when I moved into this place 17 years ago, filled with corroding old paint and stain cans, various kinds of cements and glues and solvents and other toxic substances that inevitably leak and spill and are really hard to safely (and legally) dispose of. So somehow, I’ve never cleaned it out. But now that I’m climbing that ladder to get to the roof more often, the nastiness of the space has really struck me. I’ve also been reading Margaret Wheatley and Deborah Frieze’s book, Walk Out, Walk On, which I’ve written about here. One of the most striking stories in the book is of a group of people in Brazil who took an abandoned apple warehouse filled with sludge — “layers of dirt, asbestos, syringes and excrement” — and turned it into a thriving community center. Organized by a group of Brazilians who started the “School of Warriors without Weapons,” the community of Paqueta, realizing that no one else was going to come clean up that old warehouse for them, decided to take on the task themselves. Working just 15 minutes a day each, volunteers who’d created a vision for what they wanted the place to be cleaned out the 11,195-square-foot warehouse and transformed it into something their community really needed: a healthy public space. It’s an amazing story that inspires me in all sorts of ways, especially as I think about how coaching skills could help advocacy and community organizations. But what it inspired me to do the other morning was to clean out my closet. After descending the ladder, I was about to just close the door once again on the dirt and muck and leave that project for another day. Maybe I was influenced by that post-yoga feeling of well-being, but it suddenly struck me that no one else was going to come and clean that closet up for me. And that actually, doing just a little at a time wouldn’t be all that difficult. Sure it’s kind of gross, but I can wear rubber gloves. It’s really not that big a deal. So I pulled out the gloves and some sponges and paint scrapers and I cleaned the damn thing up. And you know what? It wasn’t that hard. I haven’t gotten rid of all the old containers in there yet, but it only took me about an hour to clean up the layers of grime that had built up on the shelves and the molding, and the chunks of debris scattered on the closet floor. And man, did I feel better afterwards. We’ve all had that experience: some task looms before you that you don’t want to tackle because it seems really impossible and unpleasant and like it will take forever. But imagine how nice it will be when it’s done; then just start where you are. Eventually, you’ll get there. Life is glorious, but life is also wretched. It is both. Appreciating the gloriousness inspires us, encourages us, cheers us up, gives us a bigger perspective, energizes us. We feel connected. But if that’s all that’s happening, we get arrogant and start to look down on others, and there is a sense of making ourselves a big deal and being really serious about it, wanting it to be like that forever. The gloriousness becomes tinged by craving and addiction. On the other hand, wretchedness–life’s painful aspect–softens us up considerably. Knowing pain is a very important ingredient of being there for another person. When you are feeling a lot of grief, you can look right into somebody’s eyes because you feel you haven’t got anything to lose–you’re just there. The wretchedness humbles us and softens us, but if we were only wretched, we would all just go down the tubes. We’d be so depressed, discouraged, and hopeless that we wouldn’t have enough energy to eat an apple. Gloriousness and wretchedness need each other. One inspires us, the other softens us. They go together. I’m not equating cleaning out my closet with life’s most painful moments. But the point applies even to the simply unpleasant and annoying tasks we try to avoid: if everything were easy and good and clean and beautiful all the time, we wouldn’t really see and appreciate it. Nor would we appreciate how difficult life can be for others, whose lives may be dominated by many more annoying, difficult or even truly wretched circumstances. Even in taking on grubby little chores, we can find compassion for others, and greater possibilities for ourselves. This entry was posted in Uncategorized and tagged Brooklyn, Buddhism, clean, coaching, compassion, dirt, leadership, Margaret Wheatley, mindfulness, motivation, nonprofit organizations, Pema Chodron, rooftop, yoga. Bookmark the permalink.